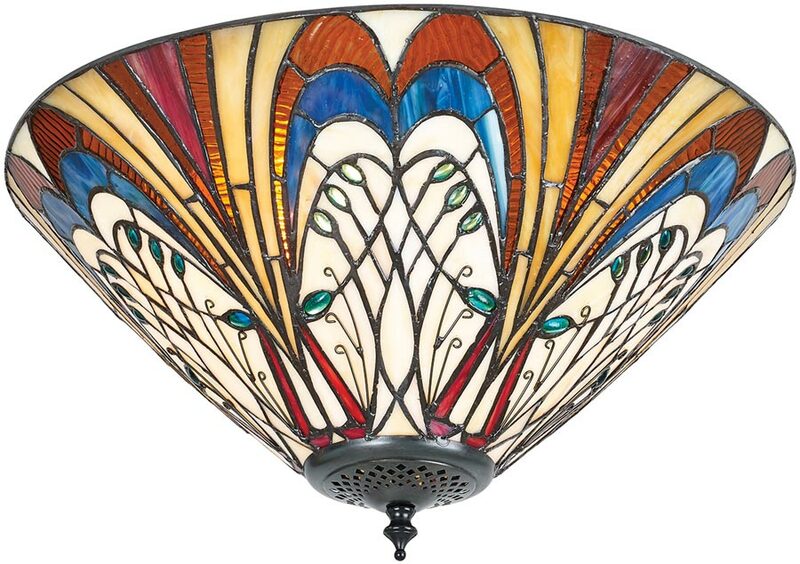 The Hector medium Art Nouveau style 2 lamp flush Tiffany light is vibrant and exciting. 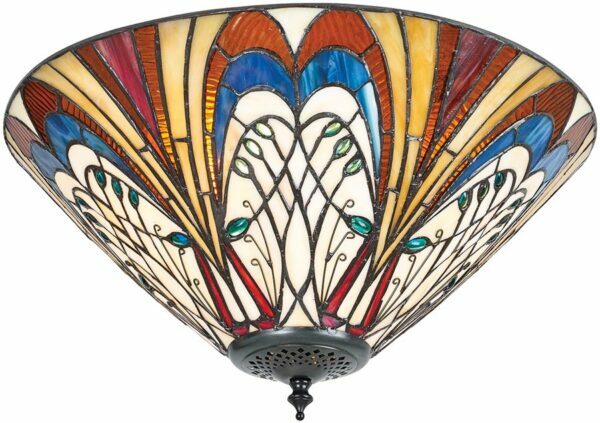 A wonderful hand crafted Tiffany glass shade featuring vibrant colours in a geometric design, suspended from a fixed height flush mount and secured by a lower finial. A wonderful medium sized flush Tiffany light, with vibrant blues, reds and golden amber laid over a neutral cream base colour, this lovely pendant lamp design will grace any period Art Nouveau or Art Deco theme. This complete range is inspired by the Art Nouveau designs of Hector Guimard, who is responsible for many of the stunning designs that grace the Paris Metro to this day. This is a hand-crafted Tiffany shade flush mounted light and the colours may differ slightly from the image shown, as each piece of glass is hand-made and may differ slightly in colour or shade. This should not be seen as a fault, rather something that makes each Tiffany shade unique. The Hector medium Art Nouveau style 2 lamp flush Tiffany light, designed and manufactured by Interiors 1900.